One week after they forced Carl Mears into compliance over satellite temperatures, the climate mafia has forced the University of Colorado into compliance over satellite sea level measurements. The same story repeats itself over and over again. Climate scientists adjusting the data to increase the imaginary effects of global warming. 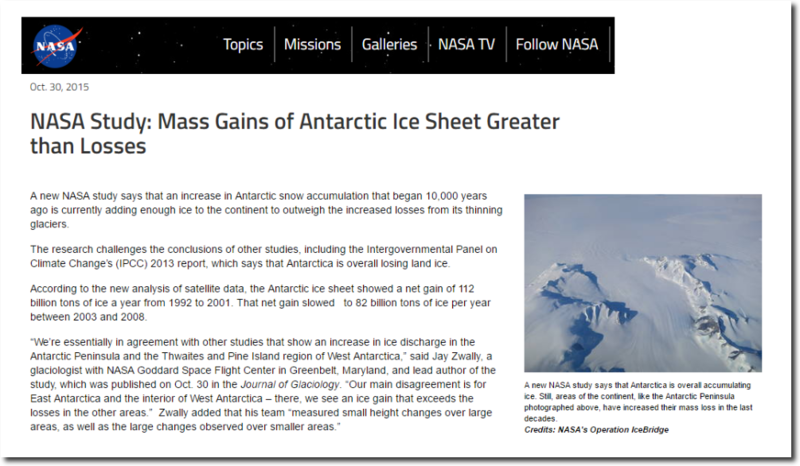 Never mind that Antarctica is gaining ice, not losing it, causing sea level to fall. Never mind that the surface of Greenland has gained more than 600 billion tons of ice over the past year, causing sea level to fall. 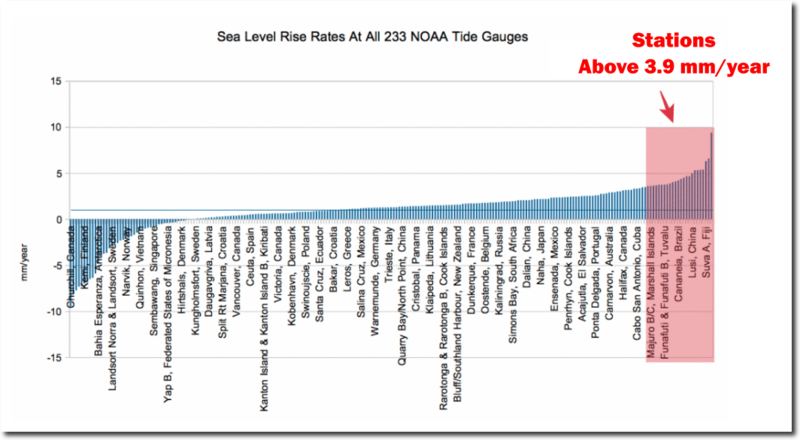 Never mind that tide gauges don’t show any increase in the rate of sea level rise, much less a doubling. The latest claims are more than double what tide gauges show. 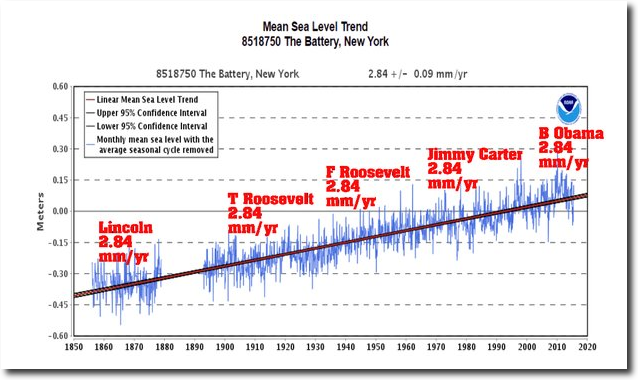 Ninety percent of tide gauges show less sea level rise than the latest satellite adjustments. 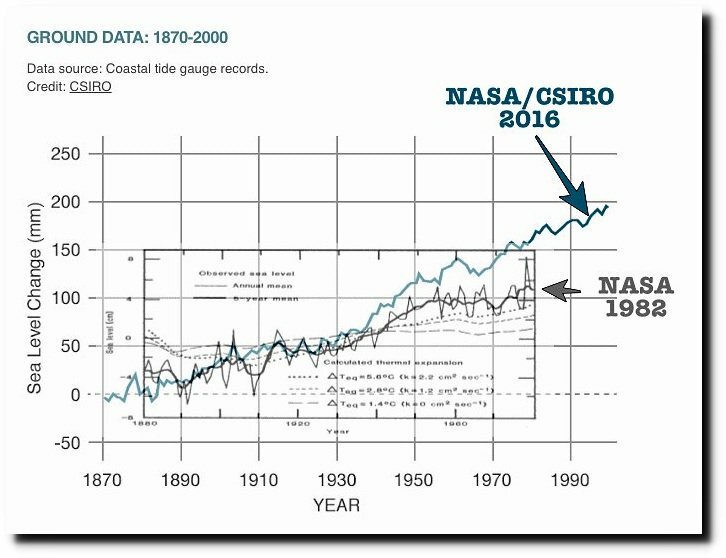 The climate mafia is also at work trying to increase the rate of tide gauge sea level rise, but individual stations don’t show this increase. These people are not scientists – they are criminals perpetrating a multi-billion dollar fraud. They need to be called out and shut down permanently. This fraud needs to end. With Antarctica showing a slight overall gain in SMB and Greenland’s SMB growing after several years of gradual decline they have to do something to keep the scare alive. With those two sources of greatest potential for significant SLR out of the picture for now the next greatest potential natural contributor to SLR is thermal expansion. Granted that overall the global SSTs have been elevated for several years now, but when that ends, and it looks like we’re heading that way after several significant El Nino’s, then their only option is to enhance their lies and the “adjustments” their based upon, just like they have been with Greenland’s SMB and Global Temperatures. Lying will not sustain the scam indefinitely so unless Ghia starts cooperating the days of the global warming/climate change scam are numbered. 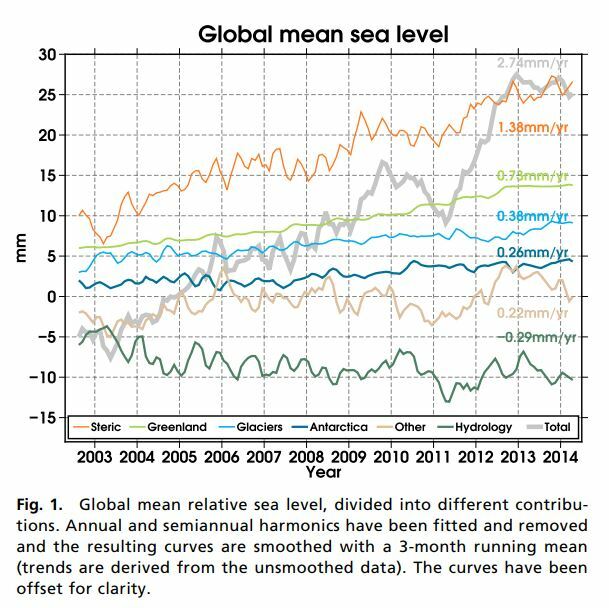 Seems to be relatively minor as to it’s effect on raising sea level. These guys really have no sense for shame. Thank you Tony for featuring this latest insult to science. Below is a Then and Now 1994 vs 2017 comparison of CU Research Group’s data. The answer in Del Mar is simple. I live just north. When they built a harbor in Oceanside in the early 60’s the sand flow was interrupted. Plus some other groin/jetties were put in. The sand would normally be swept off the beach in winter then pushed back in the summer with southerly swells. Now most of the sand is to far offshore. Recent offshore surveys have found large deposits of sand. A few years ago they did a massive sand replenishment but like the article said it’s expensive and short term. Yes it’s manmade but not climate change. Well… surely being scientific and American and such, and with the purest of motives, Comrade Gerard Piel’s magazine must be privy to unpublished Revelation not comprehensible to the Great Unwashed. Indeed, did not Comrade Piel, before his bodily canonization into Heaven, vouchsafe unto us lesser beings “The Acceleration of History”? Surely his acolytes can in the tradition prophesy “The Acceleration of Sea Level” in ways so mysterious that no amount of infidel integration will decompose that derivative into a displacement along the vertical axis visible to the incompetent and stupid. Only the most enlightened folk, fully deserving of their government jobs and hand in the till, can discern such miraculous rectification of crude data into Truth. There is only one solution to all of this: We must locate large statue markers one meter above sea level, set in stone in a hundred major locations around the world, in popular places and on them say this is where sea level will be in 2100, signed the UN. The mafia is bound to alter all the data, change all the stories, restrict free discussion, and pass this charade down from generation to generation…so stick their predictions in stone all over the world. We will all be gone, but these monuments to stupidity will hopefully endure so that maybe a new generation can see at least one piece of evidence that these fools and this “science” are frauds. Sorry, but the stone markers of the Western civilization have been there all along. It doesn’t matter to the “progressive” mind. and dozens of huge harbours all around the world. I think you’re on the right track. Apparently, however, there already are markers left by the British Admiralty who did an comprehensive survey of the Atlantic and Pacific coasts in the 19th century. I have seen a map for the harbor near where I am from 1845. A project I’ve been thinking of for some time involves using the map to compare present sea levels, as well as trying to track down old photos, etc. but I haven’t had time to do anything. Anyway, a world-wide project on sea level in the spirit of the surface temperature station project might well be in order. For future consideration, Tony, I propose that you begin your ‘imaginary doubling of SLR’ line, in about 1950; after all, they like to claim that ‘most to all GW since mid-20th Century is caused by man’s GHG’s. 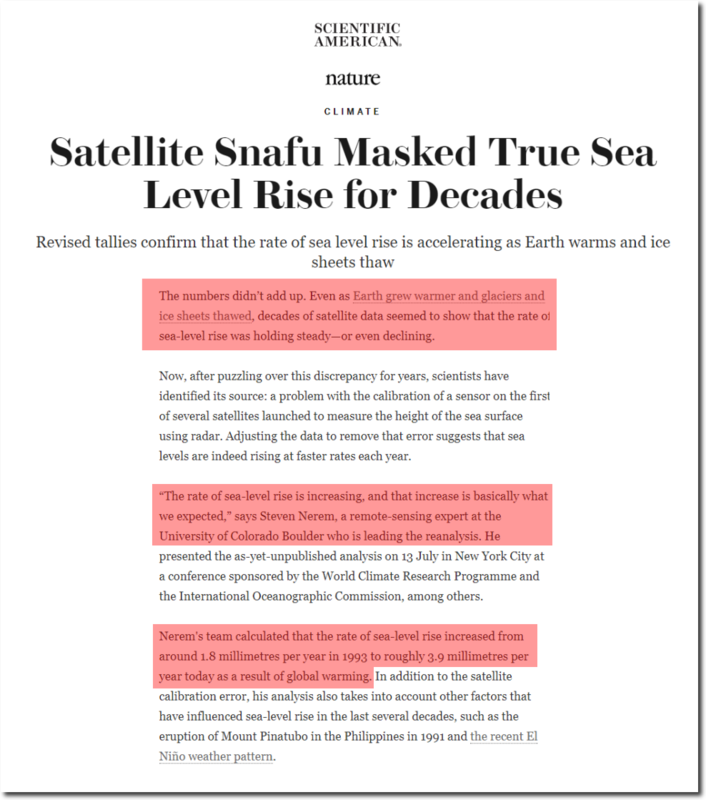 Interesting to observe that the largest MINITRUTH rectifications to sea level data occurred in Communist China, Ecological National Socialist Brazil and on a handful of islands in Oceania flung into a state of fear by pseudoscientific documentacity. 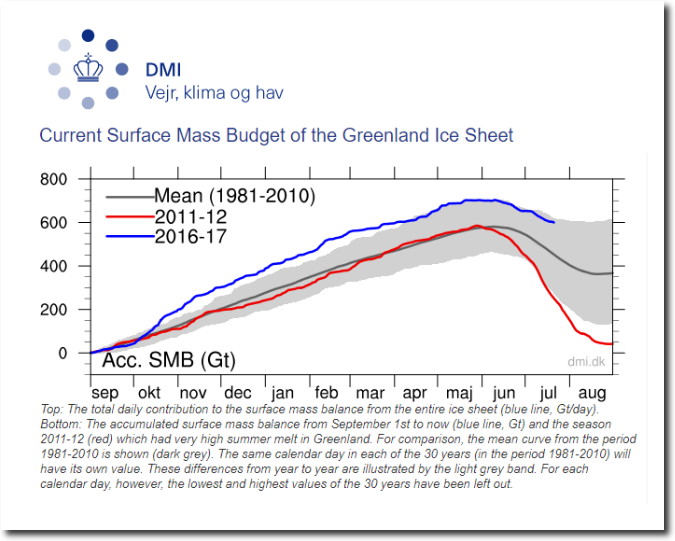 Looking at the graph of the mass budget of the Greenland Ice sheet..even the lowest year of 2011-12 shows an increase of almost 50 Gt over the year. So does that mean that right through this recent period it has grown every year? Or is there something else happening like icebergs carving off not being shown? Is there a graph that shows the total amount of the last few decades and not just the gains and losses? There is no accurate way to measure that, but climate scientists use garbage gravity data from GRACE to claim a net loss. Notalotofpeopleknowthat had a great recent article about this. The British government released a report claiming that the sea is rising ‘about’ 3 mm per year in the coast of England. Every long run tide gauge on the England coast shows a much lower rate than this. Their only flaw was to claim it was rising by some amount on the coasts, where there is data all around to scrutinize. 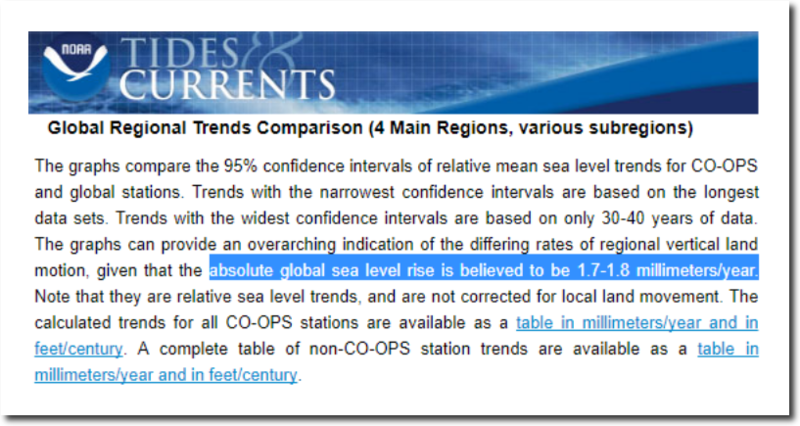 Regardless, tide gauge data all around the world contradicts the sea level scare.